Top Image Systems selected by CIOReview as one of the 20 Most Promising SAP Solution Providers of 2017. KTLA features password management platform Dashlane. CAN Capital teams up with iPayment to help SMEs get access to working capital. Let’s Talk Payments features Klarna, Holvi, BehavioSec, Trustly, Meniga, and Tink in a roundup of top Nordic fintech startups. Remember FinovateEurope 2016 comes to London on February 9 and 10. MyBankTracker names Mint, SmartyPig, Lending Club, Coinbase, and Loyal3 on its list of companies every millennial should know about. TechCrunch looks at TransferWise’s growth. PaymentEye interviews Daniel Abrahams, CEO and co-founder of CurrencyTransfer.com. Bankless Times talks with Encap Security CEO Thomas Bostrøm Jørgensen on current trends in authentication technology. PrivatBank announces support for bitcoin payments. The Finovate Debuts series introduces new Finovate alums. 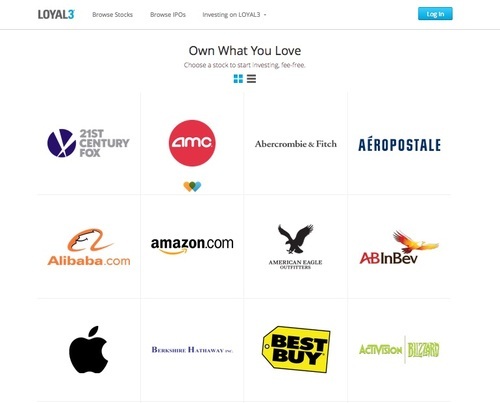 Today’s feature is Loyal3, which demonstrated its mobile IPO investment platform at FinovateFall 2014. 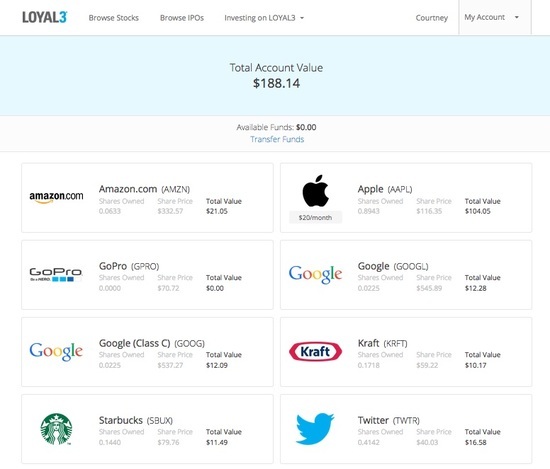 Loyal3’s stock marketplace makes it easy to invest in stocks and IPOs. 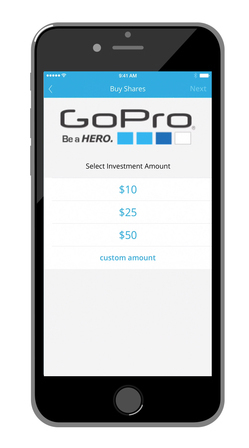 The simple user interface and lack of fees appeal to novice investors. It can also serve as a great tool for those looking to invest in IPOs at the same time and price as institutional investors. Users start by browsing the 64 company stocks available on the platform. Stocks can be purchased in $10 increments. This fractional ownership allows for more diversification at a lower buy-in. If investors are feeling bullish, they have the option to purchase as much as $2,500 of a single stock. The portfolio below shows a total of $188 divided among eight different stocks, including Apple and Amazon, which have notoriously high share prices. One of the ways Loyal3 is able to provide fee-free stock trades is by submitting orders in a batch at the end of the day. Because of the delay, the price quoted at the time the order is placed is not always the final purchase price. Loyal3 offers access to IPOs at the same price and time as large investors and institutions. Users choose the amount of stock they would like to purchase. However, since shares are limited, investors may not receive the full amount. After the price of the IPO is determined, Loyal3 sends SMS and email notifications to investors and gives them two hours to confirm or cancel their order. They can invest as little as $10 and as much as $10,000 per IPO. Loyal3 launched its mobile interface at FinovateFall 2014. It provides on-the-go access to stock trading and instant IPO notifications. Check out the demo video of the mobile launch here. Our next presenter from nearby San Francisco is LOYAL3, demoing their Social IPO Platform. “The LOYAL3 Social IPO Platform opens up IPO access to large numbers of individuals like never before. LOYAL3 partners with pre-IPO companies to give them a way to include consumers, employees, partners, and fans in their IPO. 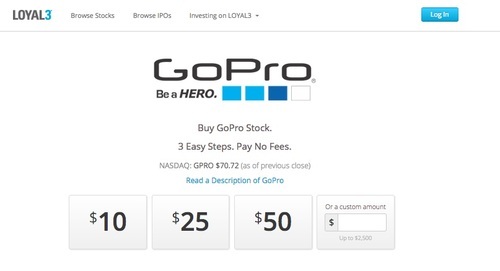 Through LOYAL3, people can start investing in an IPO with just $100 and pay no fees to purchase the IPO stock.